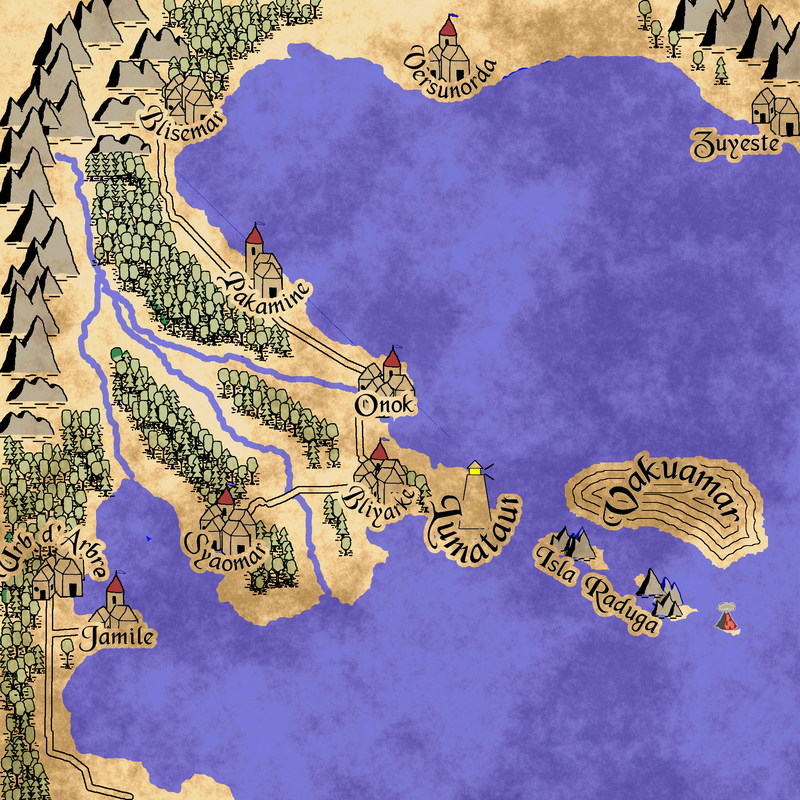 Using a tutorial on Campaign Cartographers, I was able to generate this artistic map on the Midosean region of Dwaneyarda (literally, "second earth"). I figured that the OSR doesn't need another toolbox without at least an implied setting. Dwaneyarda will be fleshed out in some detail, but not enough to be a full-fledged setting unless folks really like it. Having a setting makes it easier for taking ideas and adapting it to your game of choice. Dwaneyarda will also demonstrate the implementation of the rules and serve as a place to provide examples. Many, but not all, the names are derived from a conlang called Lingwa de Planeta. The Midosean region is one of only two major bodies of water on the planet. The other major body of water, Nordeosean is a vast arctic sea that lies far north of this map. Spells used by Priests are collectively referred to as miracles. The use of psionics is as widespread as the use of magic. Some schools of magic (along with spheres of miracles and disciplines of psionics) are more accepted than others. For example, the Necromancy school of magic is practiced in secret. Dwaneyarda has a solitary continent. The place names will be provided with an English Translation of the name. Materials created will have both names, but maps will always have the Dwaneyardan names. The names of anything pertaining to player information (classes, kits, spells, schools of magic,etc) will be in English with Dwaneyardan in parenthesis. The Vakuamar (literally, the "empty sea") is an area of strong magical activity. Some believe it is a gateway to the multiverse. Others believe that it is an aberration of nature generated by the unfettered use of magic. The borders of the Vakuamar are not literal - sailors have encountered it everywhere on the Midosean. However, most encounters take place north of the Isla Raduga ("the Rainbow Islands") so maps are drawn with it there. The Lumataui is the great lighthouse than can be seen from almost anywhere in the Midosean. It was built for sailors to navigate around the Vakuamar. If the light of the Lumataui is not visible, you are likely inside the Vakuamar. The cities on the map with towers are autonomous city-states. Those without towers are vassal states to another city. There are hundreds of villages, each with allegiance to one of the city-states not shown on the map. The river is called the Anchun-Riva (literally, The Safe River). The origin of the name is uncertain though it may refer to the fact that the Vakuamar doesn't affect boats on the river. Branches of the river share the same name. Residents of the Midosean region do not make reference to the various branches of the river calling all of it Anchun-Riva. When describing the branches, they reference landmarks. Feel free to use the map if you like it. If anyone is interested, I'll post the GIMP xcf file and the brushes I created. I like the format of this map because it is less tactical than a hex map or a spatially correct map.